Do you know about STREET WISDOM? Do you know about STREET WISDOM? Join us to unlock fresh thinking, solve problems, find answers and leave any fears behind you! Once a month Evgeni Mitev is hosting a #StreetWisdom event in Sofia, Bulgaria. He is a storytelling consultant and social entrepreneur, conducting a variety of events and training courses that cover the art of dialogue, storytelling, empathy and intuition. In a Street Wisdom session, you will learn the art and philosophy of dialogue – how to ask the right question and how to listen mindfully for the answer. 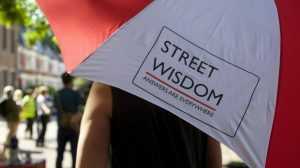 You`ll access the urban environment and find fresh answers to personal or work-related questions with Street Wisdom: a powerful, three-hour guided experience that uses the streets as an invisible university. This inspirational tool has been adopted by corporations, coaches and social groups across the globe – with profound results. We offer storytelling consultancy, events, lectures and training courses that cover the art of storytelling and its application in personal and professional life.